The Daily Randi: Bonne Saint Valentin! Easily Annoyed Sister got Engaged today! Her Longtime Boyfriend proposed to her in front of The Eiffel Tower. They went to Paris for a week-long vacation and before they left, Easily Annoyed Sister's Longtime Boyfriend rang up My MOM and asked for My Easily Annoyed Sister's Hand In Marriage. My MOM gave me The Head's Up after they left for The Big Trip on Monday, so when My Easily Annoyed Sister called me Very Very Early This Morning, I had to Pretend to be Surprised at The News. Later, Easily Annoyed Sister sent me Some Photos and An E-Mail that simply read, "I am Really Annoyed that you didn't sound All That Happy when I called." Oh, Jeeze. Of course, I am Really Happy for Easily Annoyed Sister and her Longtime Boyfriend. He is Her High School Sweetheart, so I have known him A Long Time. Now everyone in Our Family is Getting Married! TDR, can you guys have a double-wedding and save on cost?! Your the second family I know he has two daughters getting married this year. Wow! You know what this means...Group wedding! Ooh, no way! Don't let her get annoyed all over your wedding. Don't share! 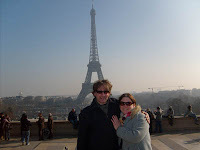 I was in Paris a few years ago! I never went up the Eiffel!! At night it was weird because it was all lit up and these guards with guns surround the place!